Super Strong Hold - Don't take the risk when it comes to your babies safety. 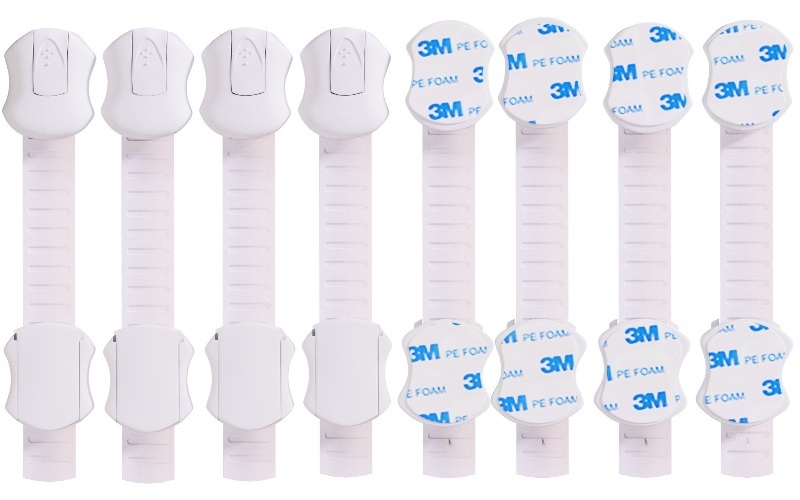 Our child safety locks come with strong, long lasting, pre-applied 3M adhesive. Available to use on all types of surfaces, such as: kitchen appliances, oven doors, furniture drawers, wooden wardrobes, glass cabinets, bathroom, metal, cupboards, toilet seat, windows, bin, cooker, dryer and much more. Easy to Use With Simple Installation - Following our simple installation guide, the safety strap can be installed in seconds. No screws or drilling required! Easily accessible by adults, but difficult for children when locked. Our locks can be removed without leaving any marks behind, follow our guide included in the packaging. 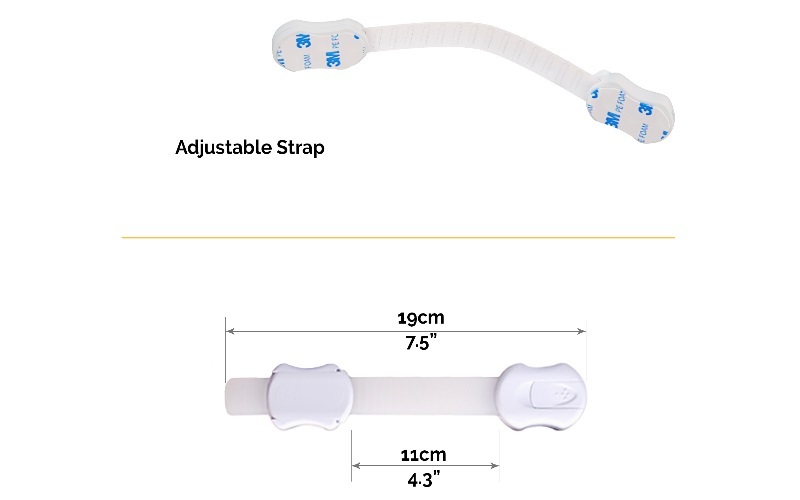 Adjustable Sliding Strap - Our flexible latches are easily adjustable to different lengths to match your desired size. This will fit any appliance or furniture, just choose your length before installation. It's childproofing at its best! Your Childrebs Safety Comes First - Every year over two million kids under the age of 15 suffer from unexpected mishaps inside the home. Our unique and stylish white lock gives you extra protection, whilst keeping the natural beauty of your home. Allowing your toddler to explore your house, worry free. Lifetime Manufacturer Guarantee - Our baby proofing locks have been made with the highest quality materials to meet our extremely high standards. We are backed by our lifetime manufacturer guarantee and offer 100% customer satisfaction, no questions asked! Your little ones are guaranteed to be Safe And Sound when you invest in our safety locks. Your childrens home can also be a very dangerous place for toddlers who love to explore indoors. As parents ourselves we understand the stress of living the daily life of a parent. Cooking, cleaning, answering calls, working from home, whilst keeping your baby away from danger. Using our Safety Locks can help childproof your home, freeing up your time so you to get on with your chores, stress free. Simple Installation with no tools or drilling required. Our locks can easily be adjusted to match your furniture. Peel of the pre-applied 3M adhesive from each side and apply to a clean surface. Baby proofing at its best! Heat the 3M adhesive slightly with a hairdryer and then slowly peel the pads away from the surface. 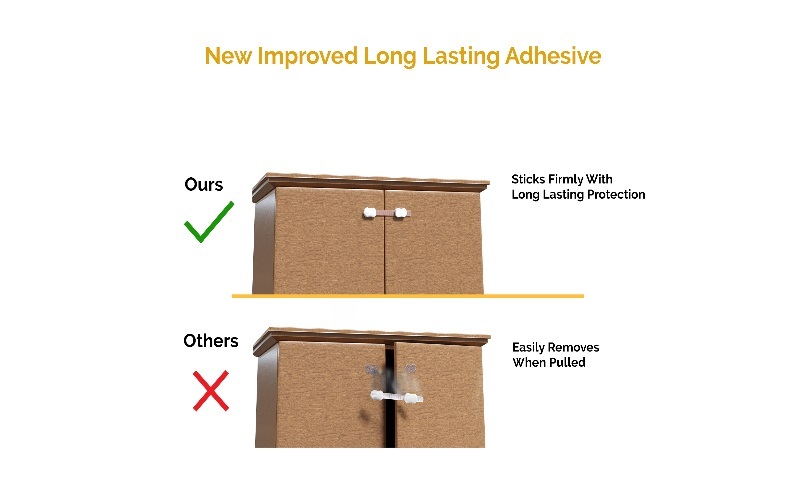 No damage or adhesive will be left behind. We are backed by our lifetime manufacturer guarantee, if you are not 100% satisfied with our safety locks, we will replace or refund your order, no questions asked!